We had watched it quite a while ago but just watched it again the other day. Janet and I both had tears in our eyes. “Mr. 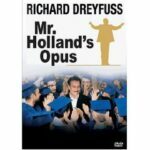 Holland’s Opus” is a great movie to watch if you haven’t seen it — or if you saw it a long time ago. A music teacher with a deaf son struggles in an average high school to teach the apathetic kids his passion for life and for music, be a father and husband and fullfil his dream — to write a symphony that will make him rich and famous. In many ways he fails on all accounts but ultimately wins something even more valuable. It is a great story for teachers, for families, for men (he heroically resists a tremendous temptation that made me stand up and cheer! ), for musicians and for the average person who loves what is good and wholesome. It is about redemption, beauty, perseverance, the value of family and of being faithful to the gifts you’ve received. Well worth a rewatch.